I think I knew it was all going to go horribly wrong the day the sign writer came round to paint the van. "What do you mean, hot jam?" he said. "Hot jam," I said. "Simply that. Like normal jam, but hot." "I don't know," he said. "I've never heard of anyone selling hot jam from a van before." "Exactly," I said. "I've got the market to myself. I'm going to make a killing." It seemed such a winning idea when I first came up with it. You see these little vans and kiosks and caravans all over the place, selling hot dogs and burgers and chips and kebabs. But what if you don't like hot dogs and burgers and chips and kebabs, I thought? What if you really like jam? No one caters for you if what you want is jam. So I gathered up what I had of my savings, took out a loan, maxed out all my credit cards and bought myself a van. We'd serve jam, I said. Hot jam. We'd serve hot jam to the people of Great Britain in car parks, in laybys, at village fetes and football matches. We'd serve it on sticks, in buns, in cornets and on wafers. Very soon we'd have a fleet of vans touring the country, bringing hot jam to the nation. "Mummy, mummy - is the jam van coming? Please can I have an apple and blackberry fritter and a packet of marmalade scratchings?" But no, it was not to be. The jam lollies slid off their sticks, the raspberry preserve soaked through the buns and my apricot specials putrefied in their little paper cases. The people spoke, and what they said, almost to a man, was very much along the lines of "thanks, but I won't, if you don't mind." I lost my house, my savings, my family and my dignity. The only thing I was left with was the jam van since even my creditors saw little value in that. I am destitute. 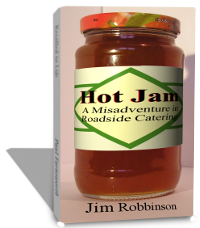 Which is why my book Hot Jam: A Misadventure in Roadside Catering comes out next Tuesday. With any luck I might at least be able to salvage something from this sorrowful affair.